A Quebec court will decide whether a lawsuit against two Canadian-based companies that are alleged to have illegally constructed residential buildings for Jewish settlers on disputed land in the West Bank can be heard here. On June 22, 23 and 25, Quebec Superior Court is scheduled to hear a motion from the firms’ lawyer to dismiss the case. 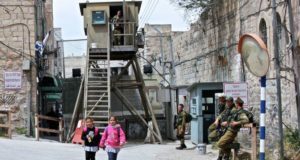 The lawsuit, filed last July by the municipal council of the Palestinian village of Bil’in and one of its residents, claims that the companies, Green Mount International and Green Park International, which are registered in Quebec, are violating international and Canadian law. If the motions to dismiss are rejected, it would be the first time that any foreign court has agreed to hear a suit against a corporation for construction of Jewish settlements on territory under dispute between Palestinians and Israelis. Levy has filed three motions outlining why a Quebec court shouldn’t hear the case. 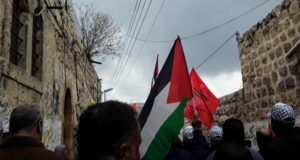 The first main argument is that Israeli courts have determined that the individual plaintiff, Ahmed Issa Abdallah Yassin, was not the owner of the land on which the companies built. Yassin, who was head of the village council, died this year and his heirs are now named. In addition, Levy said the village itself can’t be a plaintiff, only its residents. The second argument is that because this is a civil matter, it’s justiciable only where the alleged grievance happened, and the third, closely related, is that there is no aspect of this case that places it under the jurisdiction of a Canadian court. “The fact that the companies are registered in Quebec is irrelevant,” Levy said. Emily Schaeffer, the Israeli lawyer representing the plaintiffs, held a press conference outside the Montreal courthouse on June 4 to outline the arguments she, with Canadian lead lawyer Mark Arnold of Toronto, will be making. Their case is based primarily on Canada’s 2000 Crimes Against Humanity and War Crimes Act, which ratified its obligations under the Rome Statutes of the International Criminal Court. They include a prohibition against an occupying power from transferring its civilian population into territory occupied as a result of war, which is also contained in the Geneva Conventions. The U.S.-born Schaeffer said there’s a precedent for a foreign court deciding it has jurisdiction to hear a lawsuit against a company from its country involving territory disputed by Israel and the Palestinians. The French company Veolia was sued in a French court for its construction of a tram line between west and east Jerusalem, she said, although that is now being appealed. Montreal was the first stop on an 11-city cross-Canada tour that Schaeffer was scheduled to make leading up to June 22. She is publicizing the plight of the residents of Bil’in, a village of about 1,800 west of Ramallah near the Israeli security barrier. She was to have been joined by Mohammed Khatib of Bil’in’s Popular Committee Against the Wall, but at the time of the press conference, he had not been granted a visa by Canadian officials. 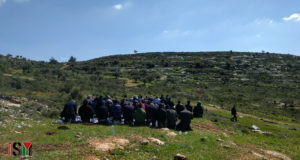 For the past four years, Bil’in and its international supporters have been contesting the loss of part of its land due to the erection of the security barrier. In 2007, the Israeli Supreme Court ruled the adjacent Jewish settlement of Modi’in Illit could expand onto that land. Schaeffer said Green Mount/Green Park bought sections of that land, a purchase she does not recognize as legal. It built 16 of the 42 apartment buildings housing about 1,000 Jewish families on the land in dispute. She said the companies also marketed and manages them. The Bil’in plaintiffs are asking for three things in the lawsuit: a declaration that the companies’ construction is illegal under Canadian and international law; the demolition of the buildings and restoration of the land to the way it was, and $2 million in punitive damages from the companies, as well as $25,000 from their sole known officer and director, Annette Laroche, a resident of Deux-Montagnes. However, lawyers for Bil’in said last year that they believe Laroche is “a nominal director having no direct involvement” with the companies, and that they have no evidence implicating her personally in the alleged wrongs. Schaeffer said the only other information she has been able to find out about the companies, which are registered at the same Montreal address, is that the majority shareholder is a corporation listed in Panama.